Far Cry Primal takes the only parts of Far Cry 4 that I enjoyed and turns them into a full game. It basically extracts the hunting and exploration while removing the annoying parts I didn't like. I legitimately got to use a bow and arrow the entire game and it was wonderful! 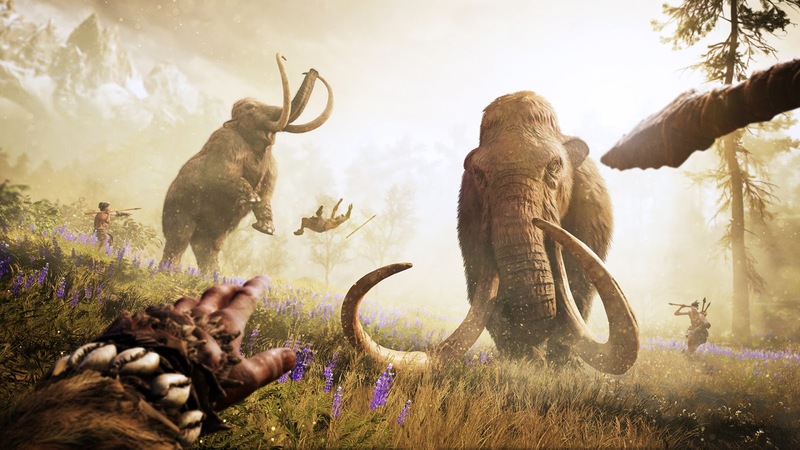 Far Cry Primal throws you back to 10,000 BC. The game is all about hunting animals, exploring your homeland, and defeating the other tribes that are trying to keep yours small. It has a very satisfying core gameplay loop. Explore, claim some new land, find a specialist for your tribe, do an epic hunt. It's a great mix of story missions (not too many) and open world exploration. I really like that I started the game with a bow/arrow, club, and spear then ended the game with a better bow/arrow, better club, and better spear. It doesn't fall prey to the classic open world endgame where you eventually get overpowered vehicles, explosives, and guns.... since it's in 10,000 BC. At one point I was riding on a sabertooth tiger throwing spears at a giant woolly mammoth and I just paused for a second to revel in the fact that this is what open world games should be for. I got Far Cry Primal on sale for around $40 and it was worth the money to me for sure. If it sounds interesting to you I would suggest grabbing it next time on Steam sale. I'm sure this is one of those titles that will slowly fall down in price until it eventually hits that $10 sweet spot in future sales. Keep an eye on it!